Read my 60th birthday tribute to Muhammad Ali from The Hollywood Reporter, exploring what made the champ "The Greatest" with noted actors (Michael J. Fox, Gregory Hines, Kris Kristofferson, Rod Steiger, etc.) authors (George Plimpton, Budd Schulberg, Gay Talese), TV journalists (Ed Bradley, Bryant Gumbel) and rapper Chuck D.
Check out my comprehensive overview of movie and TV moppets, "Child Stars: Temptations, Tragedies & Triumphs," featuring a detailed timeline, an interview with the daughter of late child star Jackie Coogan (best known as Uncle Fester on "The Addams Family") informative sidebars (e.g. "I Want to Turn My Child into a Raving Lunatic"), an audition with child actor Grant Gelt ("The Sandlot") and a remarkably prescient open letter to then super-hot Macaulay Culkin. Kirk Douglas knows all about "runaway production" to foreign locales. Sitting on a striped couch in the living room of his Beverly Hills home, surrounded by paintings by Balthus, Vuillard and other modernist masters, the screen legend can still feel the sting of betrayal 50 years later. After an arduous day of shooting boat-rowing scenes for "The Vikings" (1958) in Norway, Douglas decided to reward the locals who served as oarsmen with a party featuring a burlesque show, starring himself and castmates Tony Curtis and Janet Leigh. The extras ate the food, drank the booze, laughed, applauded and yelled for more. "And the next day, they went on strike," says Douglas, who made the film through his production company, Bryna Prods., and starred in the production. He's laughing now, but he wasn't then. "I was very mad. I called my troops together and I said, 'Tell me. What are the shots we still have to do?' I figured out we could do them (on a soundstage) in Munich. So I said, 'Pack up. We're going,' and I left." 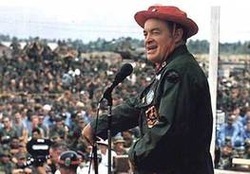 USO tours weren't all showgirls and golf jokes for Bob Hope. Read how he and his troupe narrowly missed being blown to bits by Viet Cong car bomb that took the lives of 20 people in this article from The Hollywood Reporter, featuring a canned quote from 99-year-old Old Ski Nose, whose "vital signs [were] good" at the time, according to a friend. Written for The Hollywood Reporter's 70th Anniversary issue, this article features everyone from Rage Against the Machine guitarist Tom Morello to the late author, composer and talk show host Steve Allen (in what may be his last interview ever), discussing the pitfalls, the necessities and for some, it seems, the joys of media censorship. It also tells what happened when New York crime boss Joe Colombo founded the Italian-American Civil Rights League, dedicated to combating the media and the government's unfair linking of Italians to this non-existent thing they call the mafia. In my first assignment for The Hollywood Reporter, I interview fifteen show business legends, including Kirk Douglas, Shirley Mac Laine, "Chinatown" screenwriter Robert Towne, Carl Reiner, Aaron Spelling, Robert Wise, Catherine Deneuve, Liv Ullmann, Roger Corman and Steve Allen. I talk Bogart with Lauren Bacall and hear Quincy Jones tell me I'm "a real 360 dude." (It took a week for me to figure out he was complimenting me for being "well-rounded.") Click here to read the article. What happens when the media latches on to the rumor of a star's demise? Find out here. Also check out Business Leaders, Philanthropy & Going Green and Industry Trends.